Nureva will bring its active learning solutions to EDUCAUSE 2018, which will be held at the Colorado Convention Center in Denver from October 30 to November 2, 2018. Visitors to Nureva’s booth 165 can experience how Nureva products combine to create an active learning environment that empowers students to work together more effectively and creatively. Nureva will demonstrate the Nureva Wall WM408i system, Span Workspace, and the HDL300 audio conferencing system. EDUCAUSE is an annual conference that brings together the best thinking in higher education IT from around the world. This year’s conference is expected to attract more than 8,000 higher education IT professionals to share ideas, examine the latest trends, and explore new topics in higher education. 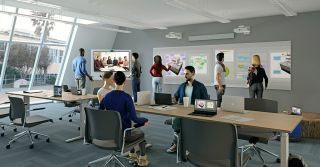 Nureva’s products are well suited for higher education institutions that need to redesign or configure classrooms and labs to keep pace with the rise of dynamic, collaborative learning spaces that help prepare students for the workplace. Visitors to Nureva’s booth can directly experience how Nureva’s full solution can support active learning approaches such as project-based learning, agile and design thinking, while easily extending the classroom to remote students.